After going 5-3-2 through their first 10 games, the WEBN Giants finished their 2005 season with seven consecutive wins, including a 4-0 win to capture the Butler County Babe Ruth tournament championship. The biggest win on the road to the title was an 8-5 victory over previously undefeated Millville Chaos. "The Chaos were 11-0 at the time, and they had just beat us in the league the week before 7-0," Giants assistant coach Ron Gaspara said. Despite getting blanked, the team was optimistic about being able to beat the Chaos if they met again. "Losing to Millville was really a good game for us," Gaspara said. "It was closer than 7-0 sounds. They just had a really good pitcher (Tyler Pennington). 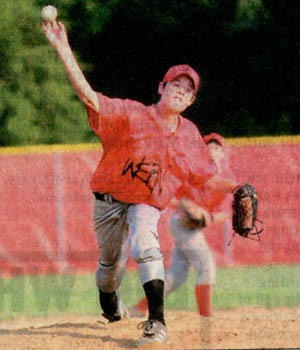 He threw really hard for a kid in a rec league." While they scraped out just two hits in the first meeting, the Giants got nine hits in knocking off the Chaos during the tourney. One of the biggest of those hits came with two outs in the seventh inning. The Giants trailed 5-3 when Ryan Groene stroked a double to score the tying runs. The two teams were still tied after eight innings when the game was suspended due to darkness. When they resumed play with the ninth inning the following day, Groene, who pitched the game's first seven innings, drove in the first two runs of a three-run inning. Brandon Kidd kept the Chaos off the board in the bottom of the inning to notch a save and preserve the victory. WEBN, which opened tourney play by downing the Millville Cardinals 11-5, followed its win over the Chaos with victories over the Fairfield Cardinals (17-7) and Fairfield Dodgers (23-13) to secure the tourney championship. "The peak was beating that Millville (Chaos) team. It just gave them the confidence to roll on," Gaspara said. The coach said 15-year-olds Ryan Buckley, Groene and Brandon Kidd helped provide the leadership for the team during its tourney run, while the 14-year-olds on the squad increased their contributions as the season progressed an into the tourney. Groene, Brandon Kidd and Caleb Hollingsworth hurled most of the innings for the Giants during the season. Although he felt the team wasn't particularly strong defensively during the campaign, Gaspara noted Billy Brockmeyer was a major plus for the outfield defense. "He played centerfield, and he did really well. He gets a good jump on the ball," Gaspara said. Offensively, the hitting seemed to get better as the season progressed. "They were really hitting the ball well toward the end of the season. We were scoring a bunch of runs," Gaspara said. Among the offensive leaders were Buckley, Brandon Kidd, Pete Walker and Ryan Gaspara. Buckley and Kidd provided much of the power in the lineup. Walker came through with some timely hits, including several during the tournament. Ryan Gaspara had nine stole bases and scored nine runs in that event. Others contributing throughout the season were Adam Burns, Jeff Kidd, Thommy Hudson, Evan Peters, Michael O'Connell and Robert Hansen. WEBN was managed by Dennis "Wildman" Walker. Assistant coaches were Gaspara, Bill Brockmier, Rich Hollingsworth and Mark Groene. Contact Mike Smith at (513) 829-7900 or mismith@coxohio.com.